Investing for Catholics provides Socially Responsible Investing (SRI) advice and portfolio implementation to institutions and individuals. Our firm was developed to meet the unique needs of Catholic investors — investing responsibly in line with our Faith while maximizing returns for the risks we take. Our services are suitable for individuals and for U.S. Catholic institutions, including dioceses, religious institutes, foundations, endowments, educational institutions and health care organizations. 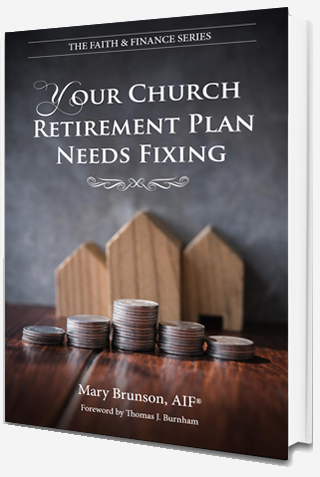 As an ERISA 3(38) fiduciary, Investing for Catholics' services are very appropriate for Catholic institutional retirement plans, including 401(k), 403(b) and 457 plans. 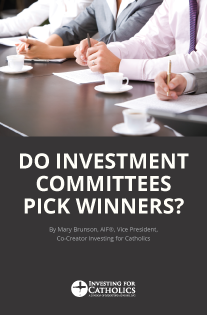 Investing for Catholics is a wholly owned division of Index Fund Advisors, Inc. (IFA), a fee-only Independent Financial Advisor registered with the United States Securities and Exchange Commission. Reduce the drain of resources and avoid the time–consuming process of manager selection by working with Investing for Catholics. Investing for Catholics (IFC) offers the highest level of fiduciary protection to meet the unique needs of Catholic institutions. At last, investors can enjoy the benefit of passive investing, without sacrificing the integrity of their convictions. At IFC, we believe that we will achieve the maximum success in business and personal satisfaction by always putting our clients' best interests first. This sentiment is more than platitude, it is written into the governing regulations under which our firm abides. IFC is committed to upholding fiduciary standards of care mandated by U.S. law. As a Registered Investment Adviser, IFC fully discloses all fees and conflicts of interest, while discretely selecting investments solely with only our clients' best interests in mind. Our firm is committed to the conviction that we are in business because of our clients who trust us to deal respectfully, ethically, honestly, fairly and lawfully. We know this is best accomplished by setting and adhering to standards of practice that are well-documented, openly shared, transparent, and beyond reproach. Do Investment Committees Pick Winners? © 2019 Index Fund Advisors, Inc.